4.00PM Lagunyasa Ekavaara Rudra Japam, Trishathi, etc. 6.00AM to 8.00PM Annabhisheka Alankara Darshanam for Devotees/Archanai. 8.15PM Kalasa Abhishekam to Lord Shiva after removal of annam. Maha Annabhishekam is performed on full moon day (Pournami) in the seventh month of every year – i.e. Aippasi (Tamil calendar) to Shiva Lingam. This year pournami or full moon day falls on 29th October 2012. 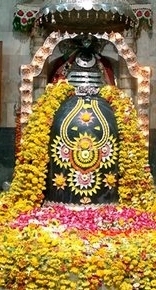 On the Maha Annabhishekam day, Shiva lingam is covered with rice and decorated with bakshanams, fruits, etc. This is celebrated as thanks giving to lord Shiva for providing us Annam or Rice. This festival is celebrated in a grand manner in all Shiva temples. It is said that watching this Annabhishekam will free us from the birth cycle, remove all obstacles and grace us with happiness and joy. Devotees who are desirous of participating in any of the seva, may please give full details like gotharam, nakshatram, rasi etc alongwith the amount to the Local Committee Member available in the temple complex or to Shri Vignesh during the temple timings.